Translation of Vaitsekhovskaya’s interview with Alexei Mishin. Test skates is an event which sums up all the work that has been done in the summer. Do you satisfied with results? A.M.: In my opinion, these skates and weekly camp that preceded them, have become for us one of the most productive and most useful activities in recent years. Firstly, technical specialists did a lot of work. Secondly, the atmosphere was very friendly. Such camps / seminars are very essential. I even wished that such test skates were carried out not only at the beginning of each season, but in the end too, when most skaters roughly prepared new programs. We often have a situation when an athlete did the program, but it “does not go”. At the test skates experts reccomend to change the program, but an athlete simply doesn’t have energy for that because he suffered a lot with previous one. Also it’s too late to re-set the program. That is why it seems right to me to clarify all questions as soon as possible: who is the choreographer, which theme, arranged elements, which of these elements require priority improvement. In other words, in order not to come in autumn to the conclusion that all summer work has gone in the wrong direction? A.M.: Of course! Among other things it will spur athletes and coaches to do programs before vacations, not after it. All that we have seen at test skates in Sochi it’s of course not the final result. But at least now we can discuss, who remains standing at the same place in comparison with last season, and who took a step forward. Whether it’s necessary to strive to show a high readiness at test skates? A.M.: Good question. Some athletes already show good physical shape, but from my own experience I can say that if a person is in full readiness in September, in March it will be very difficult for him. But what about your theory that figure skating should switch to the mode of tennis players, whose tournaments follow one another throughout the whole year? A.M.: I talked about quite different. The fact that people compete all the time, and if you claim for something serious, you shouldn’t fall below a certain level. But I didn’t say that a player should be on top the whole season. So, anyway we need to raise the bar, since we have so many serious competitions from the end of October to the end of March. A.M.: I agree. To do this, we need to build training work differently. When I’m watching the athletes, I analyze mainly two things. Their general shape and level of readiness of the programs and the state of jumping technique. Sometimes there’s a technique that just provokes an athlete to pop the jump, when he skates tired or is under the influence of extreme stress. The principle of mechanics say that the centrifugal force, which is applied to the hands of an athlete during grouping depends on the squared distance of hands’ masses to the rotation axis. And it should be taken into account if coach and athlete want to achieve perfect technique. When the skater jumps correctly, it greatly increases his chances to perform the jump with minimum of errors in an extreme situation. If everything is so simple and logical, explain what’s going on with Liza Tuktamysheva’s triple Axel. Why she can’t restore this jump? A.M.: First of all, I would like to say that regardless of results I’m very respectful and grateful to Liza that she made me a coach of the world champion in women’s figure skating. Just as Alexei Urmanov made me a coach of the first Olympic champion in the history of Russia, except Panin-Kolomenkin, of course. Just a woman’s body is such a tricky thing, you never know what to expect. Everything that happens with Tuktamysheva in terms of coordination processes it’s interesting for me as a phenomenon that should be studied – at least in order to take this experience into account working with other generations of athletes. Maybe Liza was simply strongly knocked down by her winning season, which required a lot of forces – both nervous and mental? After all, it wasn’t just about a banal fatigue, but also about learning of difficult and still rare for women’s skating new jump. And then just the reaction came. Predictably, by the way. A.M.: One of my versions is closely connected with physiology. All the rest are in the field of psychology. Although, usually it’s closely interrelated. But this is definitely not a star fever or something similar. So, what you say seems quite real. If we analyze what happened after the Olympics with athletes who shined in Sochi, they also experienced a similar process. Are you planning to repeat with Tuktamysheva the experience of her victory season – to conduct an athlete through a very large number of competitions? A.M.: Yes. Before test skates Liza already skated at one tournament in St. Petersburg, before the start of the “Grand Prix” we are planning to perform in Oberstdorf, in Finland, in Nice. I’m not entirely satisfied with the way she skated in Sochi, but at trainings I see skates that give me reason to believe that even now Tuktamysheva is able to skate much better. And generally, I would say that such a jewel in the crown of the Russian women’s single skating will never be redundant. You love beautiful phrasing, professor. A.M.: Let’s just say: even those still unstable attempts of triple axel, which Lisa does at trainings, are a pipe dream for the vast majority of girls who skate now. So, we have what to show to the world. The tendency to do all jumps in the second half of the program, which Evgenia Medvedeva started last season, in women’s skating is now transformed into technology. Don’t you think that it creates certain imbalance in programs? A.M.: I have a very simple explanation to that effect. I call this phenomenon a swing of ISU. Yes, these swings are now shied to one side, because the rules allow to get so big advantage in points. But they will come back, and quickly. I was also referring to another aspect. Remember, as Denis Pankratov, who became two time Olympic champion in Atlanta, swimmed in his best years? He swimmed half of the pool under water, and thus created a decent lead over rivals. And it ended up that just FINA banned to swim under water for so long, what leveled Pankratov’s advantage. Do you admit that ISU may make changes is rules on the basis of similar considerations? For example, to make American ladies more competitive. A.M.: It definatly won’t be a problem for our girls yo change the lay-out of jumps in program. Bias is observed not only in this. Look what is happening: people take such music, or cut the music so that the most accentuated and bright parts were also in the second half – for jumping. If we talk about the artistic side of the issue, then not all music allows you to treat her this way. But in general, I have a simple point of view: if the rules are as they are, it’s necessary to use it, that’s all. Argue with ISU, impose our views about beautiful are quite impractical. Another issue is that our sport can develop in two ways: it’s possible to improve skating, or judging. Let me explain what I mean: if we start to consider steps sequences we’ll note that almost all skaters have approximately the same blocks. It is also understandable: in terms of the rules combination of three turns of certain kind make most highly estimated block. But that leads to standardization. For the judges it’s convenient: the athlete didn’t do some turn and block fell apart. Accordingly, it’s immediately reflected on his score. If we free ourselves from this frameworks, we’ll obtain much more space for development of skating. This frameworks irritate you as a coach? A.M.: Well, what means irritate? Got married – live … Once the same Stephane Lambiel was the king of rotations. He could put any records, showed such things that head was spinning. Now spins are also standardized. So maybe it makes sense to differentiate the rules for senior and junior skaters? Leave “blocks” for juniors, so they at least learned how to do all this, and give more freedom for senior skaters. A.M.: The idea is correct, but requires development. I agree that rules for juniors should be designed in such a way as to prepare athletes for a wider range of moves. At the same time, ones who run to the finish ribbon, established at the level of a world or Olympic pedestal, the rules must be clear, understandable and common for everyone – for not to dash aside in search of “his” way. With whom it’s more interesting to work – with those who see only one goal to win, or with those who just love to skate? A.M.: These two species are actually united. I even made the formula for myself: if work in the field of figure skating brings joy, the result won’t go anywhere, will come automatically. The work through the “I can’t” with internal anguish, also can bring it’s result. But will take much longer and more difficult route, or it won’t be reached at all. From the point of view of potential results do you satisfy how Artur Dmitriev, Jr. and Alexander Petrov look now? A.M.: No. When we worked with Dmitriev before his departure to Moscow, there was a period when he started to ‘cling’ Gachinsky quite seriously. He chose to, figuratively speaking, go by Lesha Yagudin’s way. But it did not work out. Do you think that Artur left away only because he could not stand, as you love to say, the temperature of your group? A.M.: Now it doesn’t matter. Just he came back with seriously injured ankle, which took a lot of time to heal, he lost about two years. As for Sasha, he’s still affected by some omissions in preparation: no base, which had to be laid in childhood. But I can say that, first, Petrov’s quad is on its way, and, secondly, he has one unique feature. We have a lot of athletes who seem to be able to show a lot, but for one reason or another reason don’t show when it needed. Sasha always shows maximum, he’s capable of. Besides, now he revealed quite serious performing skill. Not so long ago Gachinski came back to your group already as a coach and you accepted him. Why? A.M.: Because he’s my athlete. When he left, of course, I was upset, but at the same time understand that this decision is logical. At that time we went into some kind of dead end in our work and I didn’t exclude that this move can go in his favor. But the main thing is the fact that Artur is a person without wormholes. The door to my group is always open for such athletes. Has this story with departure of a very talented athlete taught you something? A.M.: Of course. I realized that my main mistake was, as once said Igor Ksenofontov: no need to constantly try to drag the athlete on top. Sometimes you need to let him to stand in the “settler” and to think. Artur started to do everything very quickly and well. Accordingly, the level of claims sharply increased. It was necessary to decrease this level artificially, before starting the next phase of work, but I didn’t do that. You wrote a lot of textbooks. Have you thought to take part in modernization of the rules? A.M.: It’s not interesting for me. At some point I changed my attitude to work. When your colleagues ask me about plans and goals for the season, I say that the plan is simple: wake up in the morning in a good state of health, to come to the rink, teach athletes to jump, draw up the program and compose music as I like it, to design costumes, communicate with colleagues , invite friends to the country house, and if at the end of the season there will also be a medal, everything would be just wonderful. Have you always thought like this, or it came with age? A.M.: I would say a little differently: it’s the philosophy of a man who began coaching in 1969 and will celebrate the fiftieth anniversary of this work in 2019. A.M.: If I live to see it, why not. I want that direction, started by me, continues to exist when I won’t work. And it will be, because next to me in my school there are my wife Tanya, our common pupil Tatiana Prokofieva, Oleg Tataurov and Alina Pisarenko, and Artur Gachinski. This is not a team, it rather a clan. Now Carolina Kostner trains with us, it’s necessary to see with what attention and desire, she devotes herself to work. Although, when she arrived for the first time, she absolutely didn’t think that she will spend in St. Petersburg second training camp, and the third one. Coaching Kostner, are you trying to teach her something new, put your hearts, or just work with client for money? A.M.: I don’t take money from Carolina. For me, working with her it’s a challenge. I’m curious to teach her. When she arrived for the first time, she barely did combination salchow-toe loop. Now she confidently does all the jumps, including the lutz. It’s also interesting to work because I haven’t seen such a creative approach to my method. Carolina has highly developed artistic vision of the world. In her programs she’s exquisitely accurate. And very hardworking, which is much more important. Such athletes are winning not because of nature gift or any special training methods, but primarily due to the own immense work. Or take Misha Ge, who also comes to me to train. I would call athletes like him, like Carolina, destitute, deprived of trainer’s attention that their talent deserves. I can’t say the same about Russian athletes. I know that, when the leading Russian coaches just started to go to America, many skating rinks didn’t take money from them: provide free ice in exchange for the opportunity to see every day how the strongest figure skaters of the world are trained and skate with them side by side. Kostner’s presence in your group brings some educational function for younger athletes? A.M.: Of course. Just not always ability to train next to is a guarantee of progress. Like in the adage: You can forcibly lead a horse to water, but you can not make it drink. Thank you so much for translating this interview, I am a big fan of Mishin and Russian figure skaters..I am looking forward to seeing Liza back on the ice. I wish Mishin and all his fantastic pupils a successful season .. 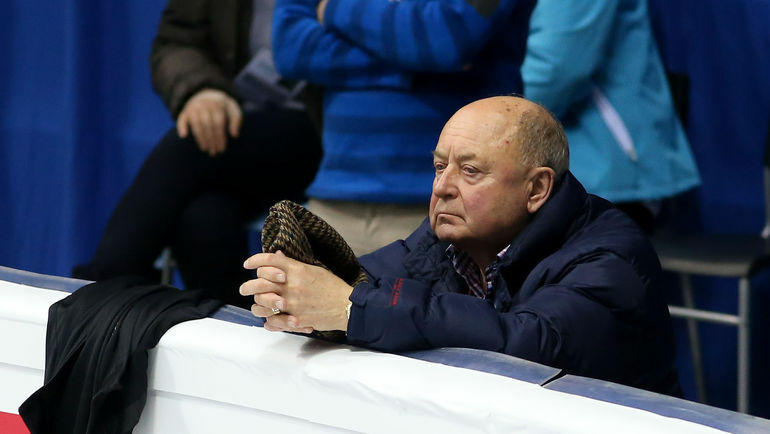 Thanks) I’m going to publish another translation of interview with Mishin soon. Me too! This site is very useful! Such a wonderful interview! Thank you very much! Keep doing what you do because your webpage is amazing! Congratulations!